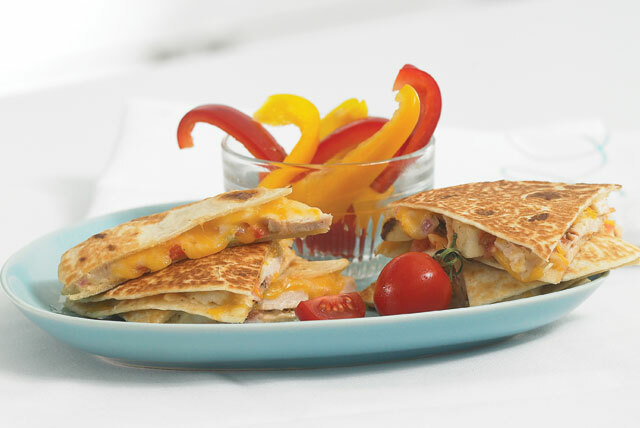 Kids will have a blast helping with these quick, easy and yummy quesadillas. 1. MIX salsa, dressing and chili powder. 2. SPREAD salsa mixture evenly onto tortillas. 3. LAYER chicken and shredded cheese evenly on half of each tortilla. 4. FOLD tortillas in half to enclose filling. 5. HEAT large skillet sprayed with cooking spray on medium heat. Add quesadillas, 2 at a time; cook 4 to 5 min. on each side or until lightly browned on both sides. Repeat with remaining quesadillas. Cut each quesadilla into 3 wedges to serve. Makes 4 servings, 6 wedges each.